How I wish it was that simple when it comes to life. When we sin. When we make mistakes. When we fall. Oh how many of us would trade anything just to go back in time, perhaps, to make things right again. The battered wife would say she wished she didn’t rush into that marriage… and into that nightmare. The convict would give anything to undo what he did. The addict regretfully remembers his first puff. The priest who fell in disgrace wished he turned his back from that temptation and away from that room. Broken dreams. Broken hearts. Broken spirits. Christ died for all our sins — those that we committed, those we continue to commit and those that we have yet to commit. NO EXCEPTIONS. Christ died for all our blunders — those that were unintentional and those that were maliciously intended. NO EXCEPTIONS. Christ died for all our weaknesses — those that we were born with and those that we have acquired over time. NO EXCEPTIONS. And because of this, we all have the ability to start again. Because he paid for our transgressions IN FULL. Has anybody paid a debt you owe somebody else? If you haven’t then it will be hard to understand what Christ did. But if you are like me who have been a recepient of other people’s generosity time and time again, then you know what it means to be freed from a burden and to be given a clean slate and a fresh start. We are often told that to be “in Christ” is to turn a new leaf. I beg to disagree. To be “in Christ” is not just to turn a new leaf but to be given a new leaf all together. Not a repair. Not a “patch up” job. Not even an overhaul. New life. New beginnings. New chances. Today, on Pentecost Sunday, I invite you to ask the Holy Spirit to give you the ability to take full advantage of this new life that Christ has given you. To make it work. To make it shine. To make it count. How would you react if a person tells you that he will not lift weights until he has muscles as big as that of Dwayne “The Rock” Johnson? Ridiculous, you might think, right? You don’t wait to have big muscles before you go to the gym and work out. Rather, you go to the gym and work out in order to develop big muscles. This “cart before the horse” mentality just doesn’t apply to the Christian life. In the Christian life, God’s work is not in staggered but in simultaneous stages. God transforms the sinner as the latter bends his knees during the Eucharist or the church service. 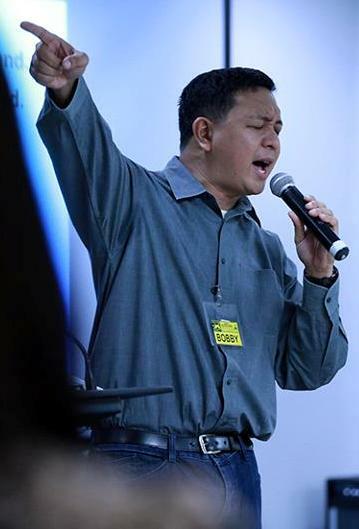 God releases the addict from his compulsions as the latter strives to raise his hands in worship during the prayer meeting. God brings the lukewarm Christian to conversion as the latter drags his feet to that Bible Study and listens regularly to God’s Word. God shapes the new Christian to maturity as the latter goes out to evangelize. Remember this: God will not wait for us to be perfect before He will work in us. In fact, He will work in us in order to perfect us. This week, I invite you to surrender yourself to God. Despite your imperfections, limitations, immaturity and weaknesses. He will shape you as He sends you…simultaneously!